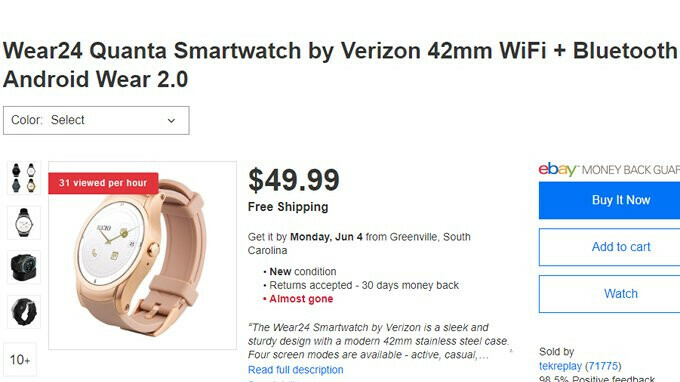 Verizon discontinued the Wear24 smartwatch only four months after it made its debut in the United States, but that doesn't mean that you can't buy the wearable device from other sources. A few months after the US carrier announced it will stop selling the Wear24, the smartwatch popped up on eBay where it sold for $130 ($220 off). Then, the price dropped to just $79.99, thus making the LTE-enabled smartwatch a killer deal for all those looking for such a device. Well, it looks like Wear24 does not want to die and a batch of units is now on sale on eBay for an even lower price. eBay seller tekreplay offers the Wear24 smartwatch for just $49.99 and adds free shipping as well. The item is brand new, but it's only available in Gold (Black and Silver are out of stock). Before buying the smartwatch, you should know that you can make and receive phone calls directly to and from the watch (with or without a smartphone), but only when using the Wear24 as a standalone Verizon phone line. However, all other smartwatch features such as notifications, voice commands, GPS and Play Store (on Wear 2.0) are fully functional from any connected iPhone or Android handset on all carriers. No pulse tracking or anything, rendering it completely useless for any sport or sleep tracking, defying the purpose of having a "smart" watch... May as well just use your regular watch for time telling.... and not worry about the battery... as for notifications, the phone shows them pretty well, so whatever.. It's not a fitness tracker. Main purpose of smartwatch is to run apps and show notifications, so you don't have to take out your phone from your pocket or bag just to check if you have any new notifications.